I’m not a Golang developer. Let’s just get that out of the way up front. I’ve developed a few things in Go, but a Go developer I’m not. I sort of need to be, but it hasn’t been essential. I decided that it was really time to take the plunge and get serious about Go. Seriously, there’s only so much you can learn by reading the internet. It’s #2 that I’ll write about here today and not because I think I did an exceptionally good job of it but because it may be useful to others, and just to record what I’ve done, in case I want to refer to it later. Read on if you’re interested! I’ve been working on a little IoT project (duh) that is using a Raspberry Pi. It also uses a Bosch BME280 breakout board from Adafruit. Which would be super easy to deal with if I was running it on an Arduino. But I’m not. And yes, I’m aware that there are ways to just run Arduino sketches on Raspberry Pi but I really am not such a fan of Arduino sketches, so I decided to do it another way. The sensor is I2C, of course, so there was that. It’s easy to make the I2C buss accessible on Raspberry Pi (just run raspi-config and Bob’s your Uncle), but dealing with I2C devices is a little harder. I tried a couple of C-based I2C libraries but most of them gave … unexpected results. The one I found that was the closest was by a GitHub user called “BitBank2” (https://github.com/bitbank2/bme280) so I decided to use his. I was able to compile it and run the example program with at least reasonable results. But then I still had to call it from some user-space program in order to get the results. I should have smelled a rathole coming, but of course I didn’t. I’ll just port it to Go! Sounded reasonable at the time. It was actually a lot easier than I thought it would be. First, there’s a great Go I2C library from @rakyll that works great. I had used it to access a SenseAir K30 CO2 sensor, so I thought I’d start there. Pretty much the rest of it was a simple translation of turning a C language construct into a Golang construct. because a call to BME280ReadValues returns a simple slice of ints as Temperature, Pressure, and Humidity, in that order. Note: The pressure calculation is currently broken, so I don’t suggest using it. As I said, it was surprisingly easy to get it all working! I now have a motley-fully functioning library for the Adafruit ZBME280 Breakout Board in GoLang! Next up is to write a similar library for the SenseAir K30 sensor. I’ve got the sensor working just fine, I just have to turn the code into a library. If you’re interested in using this library, it’s freely available on my GitHub. I’ve been on Twitter for a long time. A really long time. Longer than my actual twitter profile would indicate. (I think I first joined in late 2006.) At one point, I had over 5,000 followers, but, well, basically twitter’s security and policing was so atrocious that, for reasons of personal safety, I quit twitter and deleted my account. I was gone for about 2 years. I came back and started fresh in 2012. I came back as “TechEvangelist1” and have been tweeting as such ever since. I regularly take twitter to task for their atrocious record of handling abusers and bots and fake accounts, not that it has ever had any measurable effect on them. Twitter name transitions are not easy. It’s easy to change your ‘handle’ actually. Just go in and change it to any available handle. BUT, when you do, all ‘conversations’ with your old handle are, effectively, lost. So any replies, etc. to @TechEvangelist1 will be lost when I switch to @davidgsIoT. I’m doing what I can to mitigate this by a) downloading my twitter archive. b) reserving a placeholder account that will take the place of @techEvangelist1 after the name change and c) posting this, and a series of tweets, announcing the change. Where Have My Blog Posts Gone? I was blogging quite regularly here for some time, and suddenly not so much. Why is that? Well, if you follow me on Twitter, or LinkedIn, you’ll know that as a result of (well, sort of) a couple of my recent blog posts (specifically this one and this one) I was hired as the Senior Developer Evangelist at InfluxData. And I have to say, it’s awesome. Really. Fantastic company. Amazing people to work with. Really cool product — and yes, a database can be an IoT product. I’m not usually one to publicly take a company to task like this, but, well, this is a rather special circumstance. I’ve been an avid Withings fan, and advocate, for years. I was one of the very first people to get a Withings Activité watch. Since then, I’ve actually invested pretty heavily in Withings gear. I bought my wife a Withings Pop. I bough a Withings Body Analyzer Scale. I bought a Withings Wireless Blood pressure Cuff. I bought both myself and my wife a Withings Steel HR. This stuff adds up! Then Nokia bought Withings. And then, Nokia ‘updated’ the Withings HealthMate App and all hell broke loose. The writers at Forbes seem to think it’s an improvement, other than the plethora of bugs in the new app. I wholeheartedly disagree. I get that apps change. That UIs change. I’m good with change. However, when it’s change just for the sake of change, and it hasn’t been properly thought out, or, apparently, tested — especially with long-time users — I object. When change makes things demonstrably worse, I get agitated. I used to be obsessive about checking my status on the app. I checked my status 3 or 4 times a day. My wife and I have had a daily competition going for almost 3 years and would regularly message each other from within the app to encourage each other and/or gloat about how badly we were trouncing one another. With the new app? My wife has used it once in the weeks it’s been out. I check it every 3 or 4 days. The UI is awful. The layout of the data is even worse. The process of checking stats that used to be all on one page in the old app now takes 3 or 4 screens worth of data to find, and that’s if you can remember which screen things are stored on. The old app almost always got my exercise activity wrong — it thinks sit ups are swimming every day, even though I never swim, and tell it to never show swimming — but at least, in the old app, it showed up in my timeline, and I could easily edit it with one or two taps. In the new app? It doesn’t always show up in the timeline. When it does, editing it can take up to 10 taps, and is a convoluted, confusing process. The new colors are nice. I guess. But the overall app experience has deteriorated so badly that, finally, after putting up with this thing for long enough, today I reverted back to the old version of the Withings App. Or at least I tried to. It turns out that the last-backed-up version of the Withings HealthMate App didn’t have support for my Steel HR built in, so I can’t use it after all. Wait, they released an app without first making sure that all of their products were covered by it? Really? And I don’t know about you, but a) my height doesn’t change and b) I don’t measure how tall I am, and haven’t since I was about 12. In summary, I’m one thoroughly unhappy customer. I’m over $1,200 into this tracking endeavor, and I absolutely love the Withings/Nokia devices. I used to love the app as well. I guess I’ll have to settle for loving the devices and tolerating the app when I absolutely have to use it. Yeah, I know, “Big Data” as a buzz-word is so 5 minutes ago. The tech world is chronically ADD and prone to being distracted by the next shiny object (OOh! Look, IoT!, Wait, AI! SQUIRREL!!) But stay with me on this. It’s all connected. I’ve been saying since at least 2005 (back when Big Data was all the rage) that you haven’t seen truly big data until the IoT truly gets going in full force. Social media is pretty prolific — an average of 6,000 tweets per second, or half a billion tweets per day. That’s a lot of data. But it’s peanuts. Let’s say you have an industrial IoT deployment monitoring 1,000 machines. Each machine is providing telemetry on 7 or 8 parameters. It’s logging that telemetry 2 – 3 times per second. That’s 16,000 per second. From ONE factory. Now lets say you have 10 factories worldwide. 160,000 per second. Try to keep up. No, really, just try. Here’s my IoT Rule, again: Anything that’s based on the number of people on the planet is upper-bounds limited. When I first said this back in 2004 Sun (a moment of silence, please) had licensed Java on 1 billion cell phones. Even if every human carried 4 cell phones, that would have only been 24 billion devices (population at the time was one;y 6 billion). A limited market. IoT is not based on the number of people on the planet, but on the number of things and hence is not necessarily upper-bounded. Think about that — no upper bounds — as it applies to the devices and hence the data-stream. Now the promise of IoT systems is to provide realtime, actionable data. And really, why would you go to the time and expense of deploying an IoT system if you weren’t going to do something with the torrent of data it will provide. Even better than just providing actionable data is providing real-time actionable intelligence. The problem is, clearly, how do you actually do any sort of reasonable data analysis on 160,000 datapoints per second? That’s 9.6 million per minute. That’s half a billion per hour. So that’s the entire Twitter feed per day every hour. Every. Hour. Right now, this is not something that most people in the IoT world are addressing, or even talking about. Why? Because, obviously, they don’t have a solution for it. Look! SQUIRREL! We just won’t talk about that. But I stumbled onto something. Something really pretty amazing. Something that actually solves this problem in the most elegant way. What if you could effortlessly query and visualize a dataset of billions of rows of data? In real time. It’s called MapD. It’s a database that runs on GPUs, not CPUs (though you can run it on CPUs if you want slower performance). GPUs do really really well at parallelizing data processing, and of course graphics. So let’s just look at one of their demos. It’s the ship movements in the US between 2009 and 2015. All of them. Every.Single.One. Over 11 billion records of geospatial data. That’s a still shot, but if you go play with the demo you’ll find that you can drill down through the data. Way down into the data. My best friend is a tugboat captain. He’s been working on the new Tapanzee Bridge for the last 5 years. So I decided to see what I could see about what was going on there. I found his tugboat. I also found his tugboat, and the law-enforcement boats, the night someone jumped off the bridge and they all raced to find them. And it’s a seamless, fluid, immersive experience. Absolutely incredible! Now, if they can do that with 11 billion geospatial records of ships, well, then that’s not too far off from a days worth of data in my examples above. That allows you to actually visualize your incoming data in real time, and make it actionable. That makes the IoT actually practical and useful. Finally! I’ve been doing a lot of work on the Mynewt OS Project over at the Apache Software Foundation. It’s still ‘incubating’ so it’s not a full-fledged Apache project yet, but we’re making huge progress and it’s coming along nicely. In fact, we’re just releasing our first beta versions of the 1.0 release! If you’re an IoT hacker, and are looking for a small, fast, highly configurable (and open source!) RTOS, MyNewt it the ticket! All of that being said, one of the things I’ve been working on — other than documentation — are demos. The Sensor APIs are a work in progress, but the progress has been fairly significant. So much so that I was able to build a demo attaching an Analog sensor to a Mynewt-powered device and start sending the sensor values out via Bluetooth! The basic setup is a Nordic Semi NRF52dk Developer Kit Board, an eTape Liquid Level Sensor, and a cylinder full of water. The sensor goes in the water, the nrf52 board reads the sensor, and sends the sensor values out. I’ll write a separate post about the actual nrf52 setup, etc. shortly, but I wanted to write a bit about how I got to be able to read the values. TL;DR: I wrote a Mac OS X and an iOS App to do it! One of the problems with sending data over Bluetooth is that, while sending the data is easy, letting the peripheral device know what kind of sensor it is tends to be a bit more problematic. I solved this problem by setting two bluetooth characteristic UUIDs for each sensor. The first, which I call the “Configuration UUID” is a 16-bit UUID (yeah, I know, I should use 128-bit UUIDs, but that’s a pain) that simply carries an ASCII string describing the sensor. The second is a paired UUID that I call the “Data UUID” and that is a NOTIFY characteristic that will carry the actual data. I call these “paired UUIDs” and I define them by giving the Configuration UUID a prefix of “0xDE” and the Data UUID a prefix of “0xBE” I pair them by giving them both the same ‘suffix’ so 0xDEAD and 0xBEAD are paired by the common ‘AD’ suffix. You can change the Prefixes in the App, or just subscribe to all the NOTIFY characteristics found under the defined service Characteristic. You can click on the RSSI Signal Graph to add the raw RSSI value to the table, or click it again to remove it. I think they’re pretty cool! It’s not IoT, but still … Here’s the background on this project, and why I undertook it. For the past 3 years or so my wife and I have been volunteering with the blind in our community. Every month our church organizes a dinner for the blind in the area and we drive around and pick up participants, take them to the church where we serve everyone dinner, and the drive them all home. It’s great fun, and something both we, and the people we drive, thoroughly enjoy. It gives them a chance to get together with friends and share a meal, some music and a great evening. Logistically, though, it’s a bit of a nightmare. Every month there is a call for volunteers to drive, amassing the list of people that want to come, and then the arduous task of figuring out routes for everyone that minimizes travel time and maximizes efficiency. For the first few years this process was fairly opaque. Each month we would volunteer to drive, and then a week before the event we’d get an email with who we would pick up and their addresses, etc. Behind the scenes, however, one volunteer was spending hours mapping out the routes and assigning passengers to drivers in what was hoped would be an efficient manner. It wasn’t always. This is exactly the kind of problem computers were designed to solve! So I volunteered to solve it once and for all. Ok, so computers can’t solve the problem, but a well-designed computer program could. I just had to write it. About 30 volunteer drivers, each with their own ‘restrictions’ on how far they’re willing to drive, how many passengers they can take, etc. About 75 attendees. Some with dogs, some in wheelchairs, some with physical disabilities of various sorts, etc. Here’s where I ended up. After this, I’ll briefly go through how I did it. I’ll walk through the work-flow a bit too. We start here, with a blank page, a Google Map, and some empty tables. You can click on “Add Driver” and add a new driver to the Database. You get the same form if you click “Add Attendee”. All Drivers and Attendees are persisted in a MongoDB database. Once you select a Driver, they end up in the Drivers Table, with their own ‘mini-map’. A Blue Pin is also added to the main map. As you add more drivers, you’ll see more and more Blue Pins for drivers on the main map. Next you select Attendees from the Attendees Drop Down list. As you add Attendees they are added to the Attendees Table, and a Red Pin is added to the Main Map. As you select more and more Attendees, you’ll see more and more Red Pins on the Main Map. It is a little more complicated than you might think is necessary because I reference everything by the id from the MongoDB database so that I can look it up later more easily. I don’t keep track of the Driver’s address, phone number, etc. from the tables because a lookup by id is very fast, so as long as I have the id handy, I can get any other information quickly. Once you assign a Driver to an Attendee, their Red Pin is moved from the Main Map to the Driver’s mini-map on which you can Show/Hide the actual driving route. Yes, it’s small, and hard to see the actual route. Also, the Attendee’s entry in the Attendee table is turned green and a Driver Name is filled in for them. This is so that it is easy to tell when everyone has a driver and you’re done) No more red pins on the main map and all the Attendees are green. // everything is referenced by ID! cell.innerHTML = "<button id=\"" + data.id + "\" onclick=\"clearCell(this.id, this.value)\" value=\"" + ids + "\" name=\"Remove\">Remove<\/button>"
To look up Attendee data, I just append the Attendees database name to the end, and to look up Drivers data, I append the Drivers database name to the end. To look up a specific driver, I just append the driver’s ID to the end of that. etc. It’s really that simple. It turns out that hosting Node.js apps is harder than one would think. I tried for days to get it running on OpenShift, but to no avail. The documentation from StrongLoop on how to do that is both old and incomplete and I so far have not figured out how to make it work. The docs from OpenShift simply don’t work. What I finally found was a simple, free way to deploy this on AWS. Pretty straight forward, and when I have time, I can write up how to do that as well. I’ve sent the basic instructions and address to the coordinator who handles the routing and she has now successfully done the routing for a couple of dinners. Her comment to me was “that sure is a lot easier and faster than the way I used to do it!” The whole thing is wrapped in bootstrap code, so in theory it should also be usable from a mobile device, but in my tests on an iPhone, it tends not to do so well with the maps, making it not very useful. Let’s call it a Pandora Pi, shall we? Anyway, I have a (non-technical) friend that was always envious of the music setup I have in my house. I have a bunch of Bose Series III speakers set up around the house, connected to Airport Express Basestations so that I can broadcast music throughout the house. There’s always music playing around here, usually throughout the whole house — kitchen, living room, office, etc. Works great for me! Anyway, she wanted a similar setup in her house, but only in one room, and for Pandora. At first I set her up with Pandora, a set of Bose Speakers, an Airport Express, and Airfoil on her PC (she’s not a Mac shop, like I am) and that worked reasonably well. Mostly. But her PC was always crashing, or Airfoil would just quit, or her PC would lose network connectivity, or some other shenanigans would cause the music to stop. It was driving her crazy. So I decided to build her a dedicated Pandora Player that she could keep in the kitchen and use to play music without all the headaches she was having. It was actually easier than I thought it would be! That’s it for hardware! Only about $100USD for the whole setup. Software was just as easy. I used Raspian Jessie, and added Pithos for Pandora playback. Easy. Setting up Pithos on the 3.5 inch screen wasn’t possible, of course (I guess it was possible, had I attached a keyboard) but instead I just started a VNC server on the Pi and remotely displayed it to do the setup.) Once that was all set, I added a default application setup to auto-start Pithos on login, and it all started to play as soon as you turn the thing on. If you ask 100 people about what a resume should be, you’ll likely get close to 100 answers. And on and on. Most of it is conflicting, and pretty much none of it will work for everyone. These days, resumes are a crap-shoot. You’re likely not dealing with an actual person who will read your resume and evaluate it. You’re dealing with a key-word matching algorithm that is most likely not based on the skill they re actually looking for, but on the closest match to the keywords they have available. Then I was talking to a friend and old colleague of mine who put together his “unicorn” resume. (Someone called him a ‘unicorn’ … you know, that mythical employee that is impossible to find, but worth their weight in gold? Yeah, he and I have both been called that.). It was hilarious. He used the sort of lingo his daughters would use. Then he encouraged me to make one too. So I did. It’s too early to tell if it’s going to be any better than the traditional version. You tell me. Better yet, hire me, and get your own unicorn! 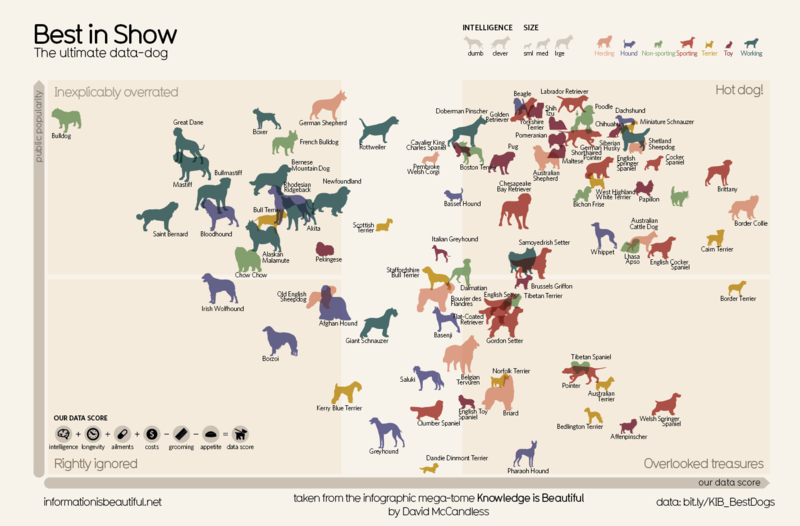 It’s like the Gartner Magic Quadrant for dogs. Thanks to Vox.com for posting it. @bitandbang @skpodila Exactly. And there’s no sense hiding them. Admit them, learn from them and move on. @MollyJongFast 33 years here. Saved my life. @wiredferret That’s a fancy sewing machine! Mines so basic in comparison. @SJHamill21 @johndickson72 @Liz_Wheeler You don’t seem to understand what the word impartial means.